In May I shared my TBR (to be read) pile with you. The first book in my pile was The Myth of Balance. 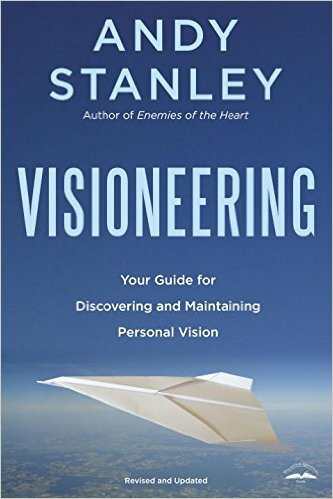 Next up is Visoneering by Andy Stanley. Andy Stanley is a pastor in Atlanta, Georgia. He founded North Pointe Ministries in 1995 and it has grown to 6 churchs in the Atlanta area and 30 networked churches around the globe. At least that's what the back of the book says ;). I first encountered Andy Stanley at the Orange Conference last year. He's a very relatable speaker. 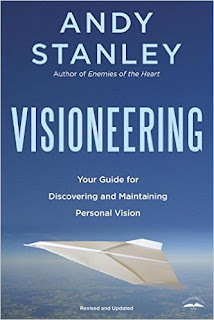 At this year's Orange Confernce, the book store had a revised and updated edition of Visioneering and I grabbed it. In Visioneering, Andy goes through 20 building blocks for Visoneering. Every building block is discussed against the backdrop of the story of Nehemiah from the Old Testament. God gave Nehemiah a vision for rebuilding the wall around Jerusalem. Visioneering is a wonderful book. It is full of so much Biblical wisdom. I like to highlight my books and this one is full of pink highlights! As I read I could relate and apply things to visions God has given me in my own life. I wouldn't go through the entire book, although I could. I could write a super in depth review but this is such a deeply personal book that you need to read it for yourself My applications and insights wouldn't be the same as yours. God has not given us the same vision. My favorite chapter is near the end of the book. It's called The Inexplicable Life. Stanley goes on to talk about 3 things that make us stand out. The first is peace. So many people are not at peace with themselves or others. When we maintain our joy and peace, we differeniate ourselves. The next is healthy relationships. Don't let your goals get in the way of people. Take care of your spouse, your children and those closest to you. The final thing that will make us stand out is our character. We can not sacrifice our characters for our vision or goals. When we compromise our character we take God out of our vision. I can not tell you how this chapter spoke to me! I get so caught up in the kingdom applicaitons of what I'm doing at church. I forget that my work at school and at home also have kingdom applications. I want to stand out. I want my life to point people to God. Everything we do, every success we have is so that God can shine through us. These are things I need to remember as I go about my day. I am called to live an inexplicable life. And so are you! !